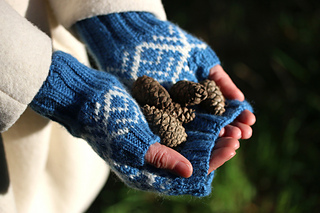 Pawkies is a Scots word for mitts, or fingerless gloves. 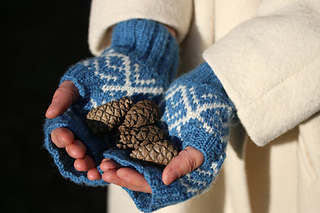 Pawkies are ideal for taking the chill off your hands on a brisk Autumn day, leaving your fingers free for picking mushrooms or blaeberries, or occasional hand-holds if you are heading high up into the hills. There are two size options (small and large) and a striped version is also available. Large size used approximately 34g / 75m / 82yds of MC and 16g / 35m / 38yds of CC. Gauge-size and below-gauge-size needles of your preferred type for working small circumferences. Small quantity of smooth waste yarn. Stitch marker. Tapestry needle. 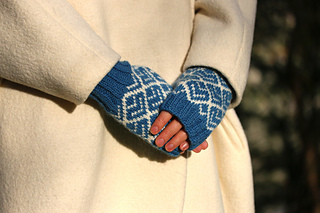 26 sts and 29 rounds to 10cm / 4in over stranded stockinette stitch using gauge-size needles. This was achieved using 3.5mm / UK 10-9 / US 4 needles. 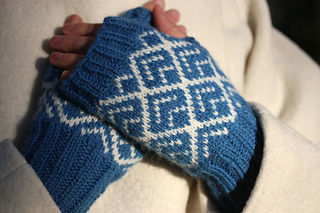 23 sts and 26 rounds to 10cm / 4in over stranded stockinette stitch using gauge-size needles. 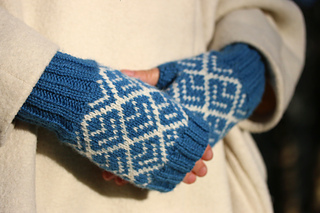 This was achieved using 3.75mm / UK 9 / US 5 needles. 2x2 Tubular cast-on method: We used the winding provisional cast on described by Åsa, followed by Ysolda’s tubular cast on for 2x2 rib, modified slightly (only 3 rows of st st are worked). Stranded colourwork: Strand the yarn not in use loosely along the back of the work. 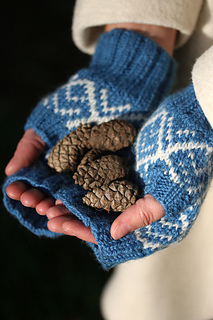 If working two-handed, the “foreground” yarn will usually be in your left hand. If you are working with both yarns in one hand, the “foreground” yarn will be taken from below. If your tension is even, there should be no need to ‘catch’ or ‘weave’ your stitches (as is sometimes recommended). If you struggle to keep the floats from tightening, it is sometimes helpful to turn your knitting inside out. This forces the floats round the outside of the fabric and helps to prevent bunching when you change from one needle to the next.